What is it like to be inside an exile, someone outed for refusal to abide by the law, or cultural or conventional norms? Two contemporary issues might help to unpack this question: the right of homophobic parents to impose coherent, religious values on pubescent students at Safe Schools and the plight of Julian Assange. Who is bullying whom in these stories? Is it possible to create a politics of fundamentally opposed moralities? And if so, will we all be exiles? As all Moons must, the Exile of January returned yesterday to the harbour of the Sun. 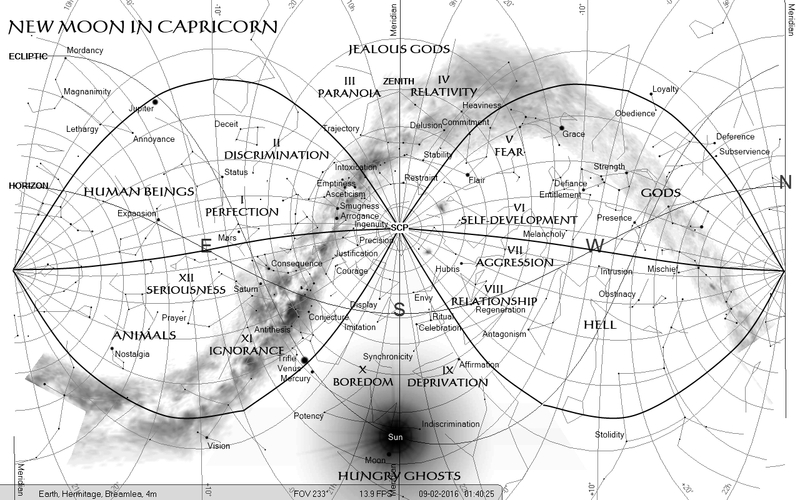 The dignity of the Sun in Capricorn offers a solution to exile and a new beginning: relativism. This is the time of year when confidence and magnanimity should burgeon in our lives, whatever the impact of what they’re doing up North. If we are all different, then we can suspend judgment of transgressions of any particular morality. If we are all one, then those transgressions deepen our self-understanding, humanity and compassion. 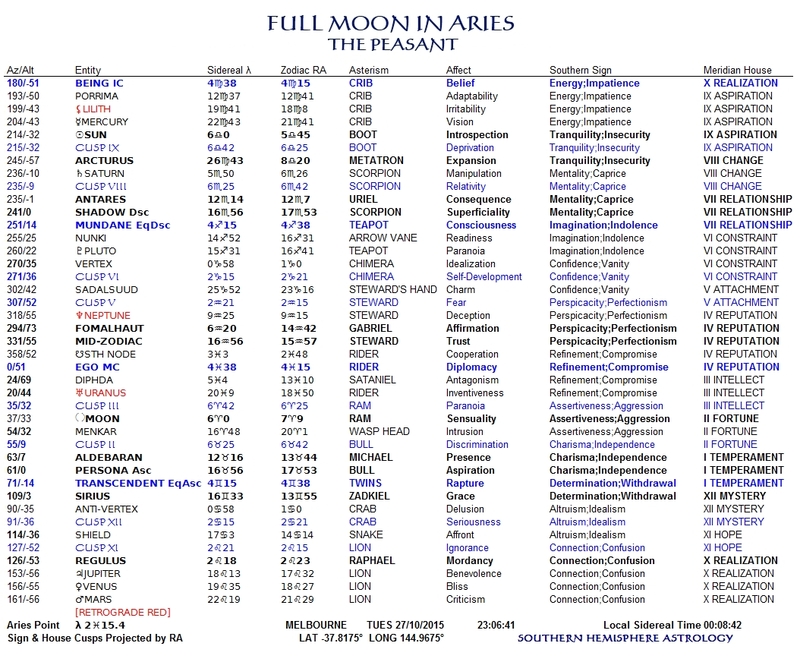 However, it could be a rocky road for the Moon this month. The value of investments is falling through the floor. Putin and Assad are winning, and reassessment of the bona fides of their opposition looks easier than confrontation. Can our self-belief survive its transparency as emptiness? It is high time we questioned the nature of authenticity. Is play the capacity to engage with instinct non-dualistically, or deluded will? Is the desire to come back to the fold an overcoming of narcissism or a clinging to conventional truth in face of the emptiness of ego? Imagining a life spent hiding, from our sexuality, our aversion to somebody else’s, or as in the role-play of the Safe Schools program, the prominence of our teeth, what is confidence, these days? R.I.P. Rene Alice Wolfe, my mother. 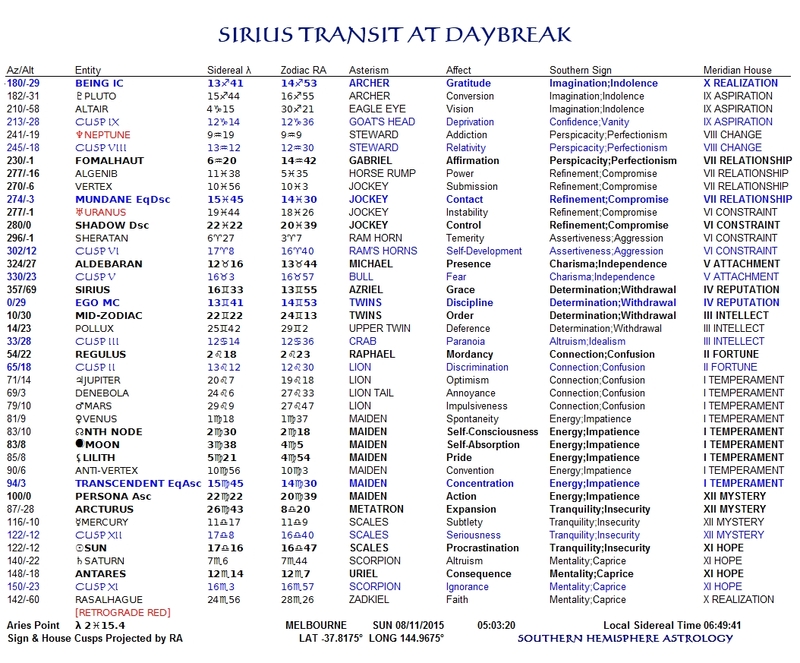 The star of expansion, Arcturus, is risen: it’s Christmas! In every moment ‘I’ am a culture seething with sensations, visions and insights, habitual reactions, instincts and humours, wafts of conversation, snatches of song, smells of bowel. ‘I’ am saturated by others, including myself, and playing conscious and unconscious part in various social transformations, even sharing them, but this is all theoretical. The ground of my being is imaginal and aesthetic. The Full Moon, back again, is drawn forward time and again to its immolation in sunlight. This is human artifice. Many hundreds of thousands of such renewals have played out in the psyche of imaginative Homo Sapiens, but only there. There are no phases on the Moon. This is not a campfire story. This is the confection of a solitary shepherd, a boy known to others, who presents himself to others, but with a self in orbit of the soul. The clock of the constellations chimes in the heart ravished by importance. And the Moon? Let him cleave to the human heart, for his orbit was the key our imagination used to unlock the neighbourhood of all stars in our ‘eternal’ emptiness of quantum nonlocality (or words to that effect–insert your own). The Sun of the seasons is a poor thing without him. “…[Dream,] the most subjective and mystical of all mental phenomena, and a phenomenon more inclusive than the dreamer himself, because it allows him both to observe himself and to be at one with the universe.” Otto Rank, Psychology and the Soul. In his arcane costume of skins and feathers he goes to sleep on a rock in a crag which offers some protection from predators. The stars are so bright they prick the skin. He dreams he is a great rock in space, hurtling around an unimaginably large ball inhabited by teeming millions of strange beings who worship him. He feels the caress of their eyes. Their hearts beat under his ribs. But a great power is vested in him by their perspective, the power not only of geometry, of phases and latitudes and azimuths, but as he soars up over their horizons he feels the power of calculus, the integrals and differentials of falling ever onwards, through ages of ice and ages of sand, now fast and close, now slow and far, in life and in death, but always falling, and always Now, forever. A goat bleats in the dark, announcing the pulse of new life, and another Tomorrow. This was the Astrologer’s dream—he who made the Sky—in Gemini one night, at Christmas, in the two thousand and sixteenth year of our Lord. Personally, I reject a spiritual path that begins with the experience of suffering, or the compassion which arises from a perception of suffering as the ground of human existence. Cut to the chase, I reckon. If the path out of suffering leads through a direct realisation of emptiness, and that is immediately accessible as soon as you step outside your tent under a dark sky, as it was for the mystics who found the Everything and Nothing God of the religions of The Book, then that is where to begin, with the immensity of the universe in your tiny, virtual, infinite consciousness. The expression, ‘Everything is connected to everything else’, is an analytical tool and a form of non-violent protest used to promote anything from vegetarianism and environmental sustainability to multiculturalism and the Middle Way. 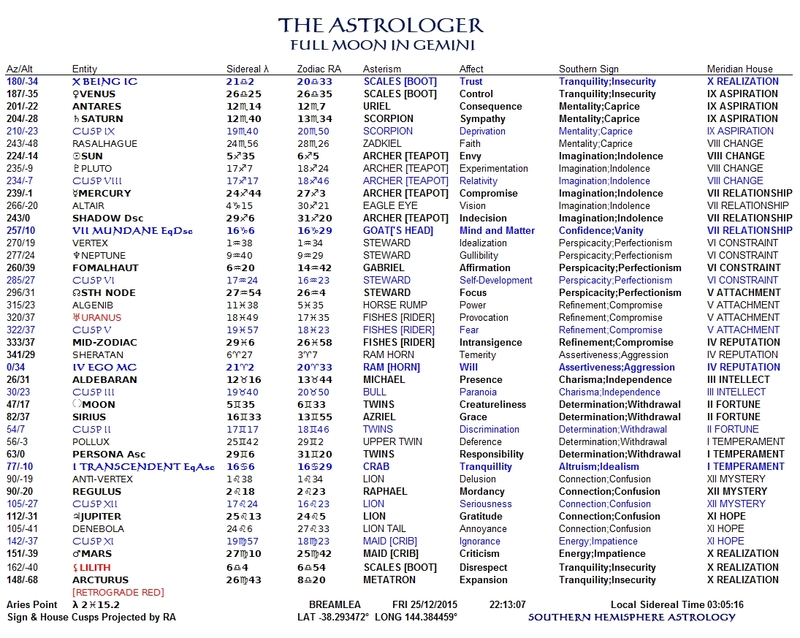 A parting gift: hesitate before you dismiss southern hemisphere astrology in favour of what ‘works’ according to other people, lest you languish in the inherited, non-imaginal prison of confirmation bias. Download it to a stick and get Officeworks to print it 4 pages to a sheet of A3 card for about $35 AUD, and give it to the person who has absolutely everything. 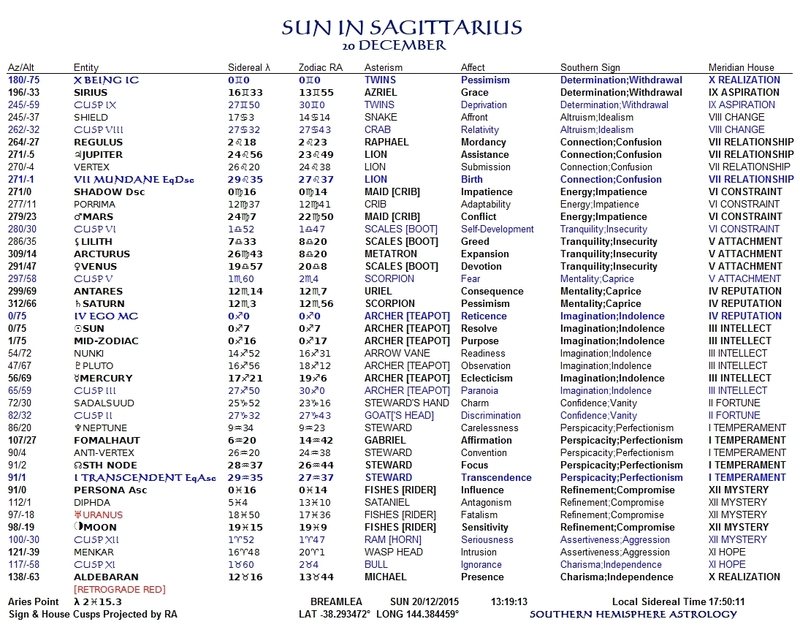 Happy Christmas from Southern Hemisphere Astrology! 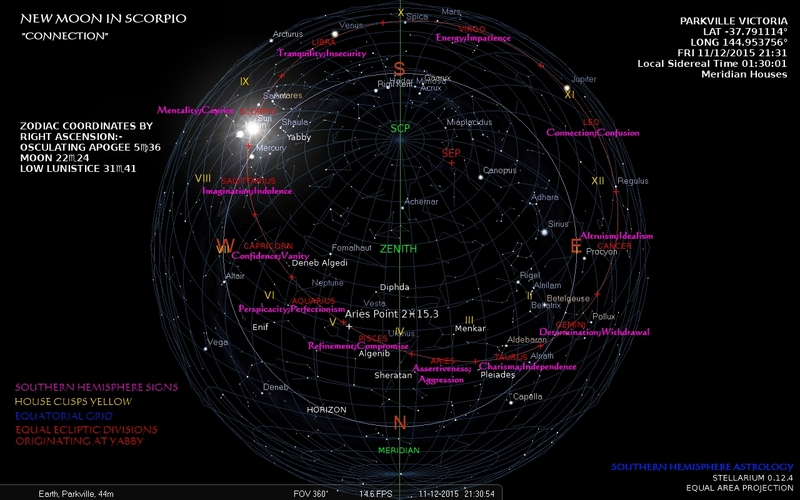 As I have pointed out before, conventional astrological charts show east on the left because northern hemisphere natives are looking at the zodiac in the south. Their houses are numbered anticlockwise from there following the order of the signs—which rotate clockwise—despite the obvious error of placing the first house below the horizon. Signs correspond to the season in which they are occupied by the Sun, and so Zodiac constellations carry the northern hemisphere’s opposite sign—ignoring the technical accuracy of placing the first 2.25° (currently) of each constellation in the previous sign, as demanded by a strict division of the year into four seasons, which we don’t have, full stop. 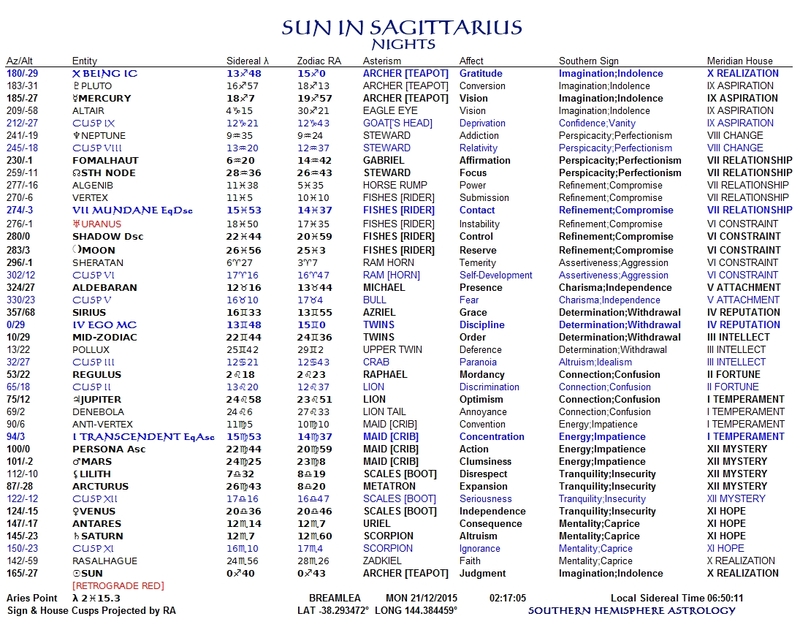 So next Sunday, a few days before the summer solstice, the Sun enters the SHA constellation of Sagittarius, which carries the northern hemisphere summer solstice sign of Cancer. To give you a picture of the boundary, which transits at nightfall in September and daybreak in April: I think it’s pretty obvious that this is a sidereal chart showing coordinates expressed in right ascension, as is the chart below. The precise correlation–and the difference is minimal, since equatorial and ecliptic coordinates measure from the same origin–between angles expressed in right ascension and the needlessly confusing angles of the ecliptic system is tabulated in the SHA 2016 Calendar, coming. 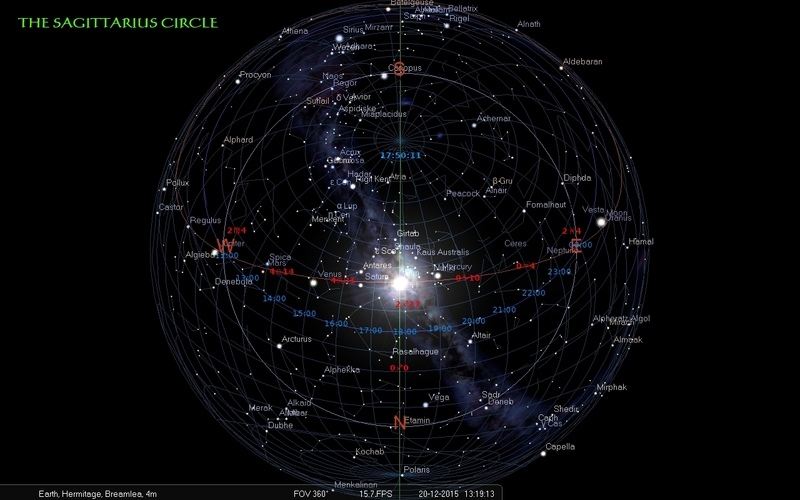 As alluded to by the Moon himself in the previous post, Southern Hemisphere Astrology gives primary focus to the Tenth House and the Imum Coeli, and not the Fourth and the Medium Coeli. I continue to choose pregnant silence on this choice, and let the resonances of dream and will, soul and ego, hidden and visible, empty and structural, ferment to your liking. 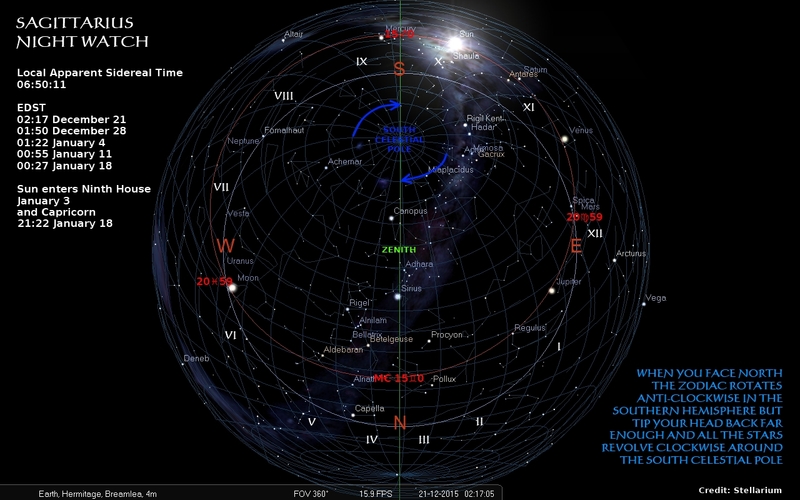 However, it is obvious that polarities link not only the hemispheres above and below the horizon, but the southern and northern geographical hemispheres as well. 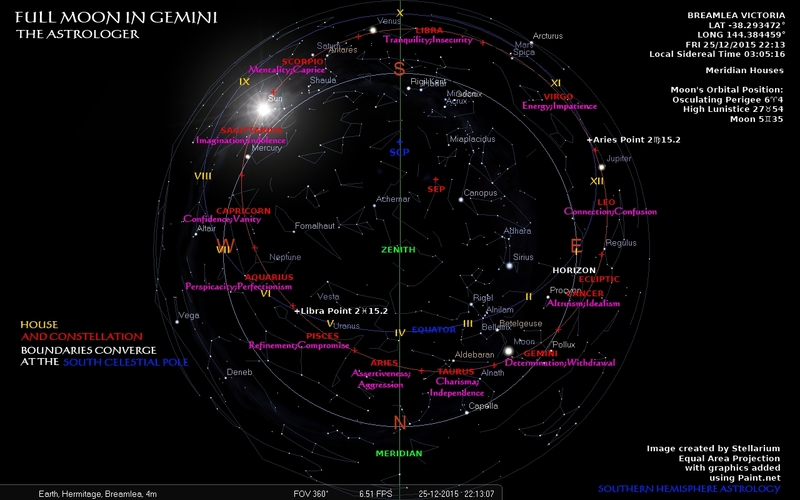 For example, note that when Sagittarius is at the Imum Coeli, and the natives are charging their batteries, the sign overhead on the northern meridian is Capricorn. 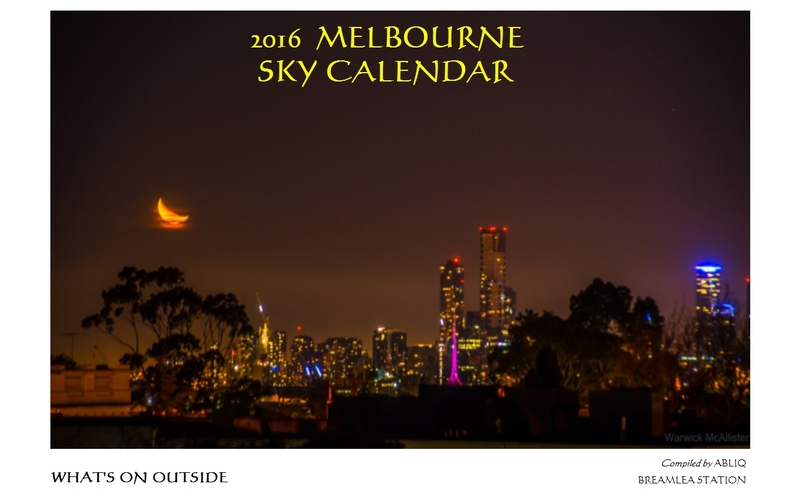 Also note that in the projection above, the sky is rotating clockwise, as it does in the northern hemisphere. The Earth only spins one way, but the direction of the sky’s apparent motion depends on an observer’s orientation. Incidentally, here is a mnemonic to remember or teach the order of the Zodiac: Gurus Can Loathe Very Little Signs Of Spiritual Change And Preach A Totality. The ‘O’ represents Ophiuchus, and ‘A’ for Aries is appropriately the first letter of our alphabet. 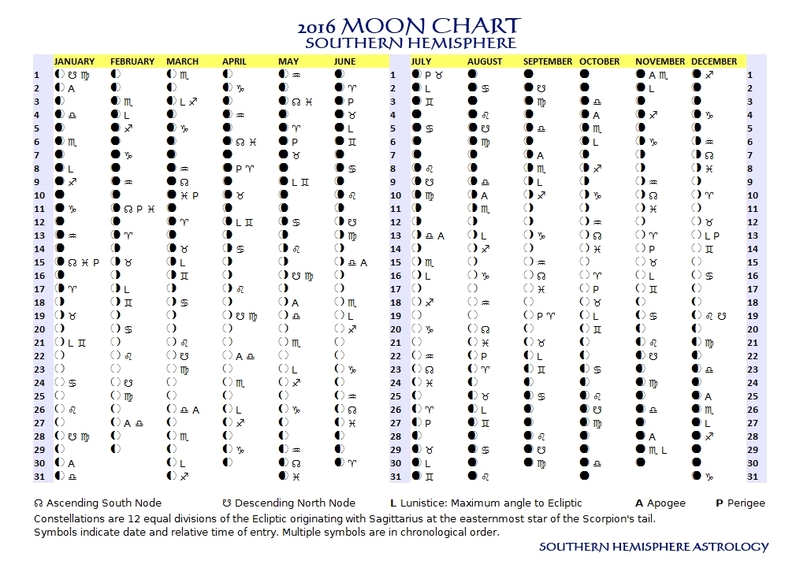 Readers of SHA are given notice that we will henceforth cease the craven practice of using Northern symbols for the nodes of the lunar orbit. The upward half-loop indicates ‘above’, and symbolises in conventional northern hemisphere astrology the moment the Moon’s orbit carries it above the path of the Sun. 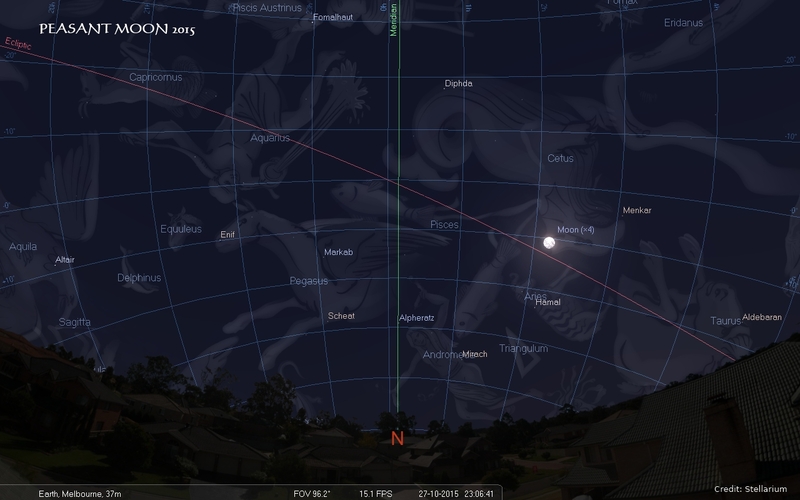 At that moment in the south the Moon is heading downwards, so naturally the downward half-loop is fitting. An end to mystifying symbols! 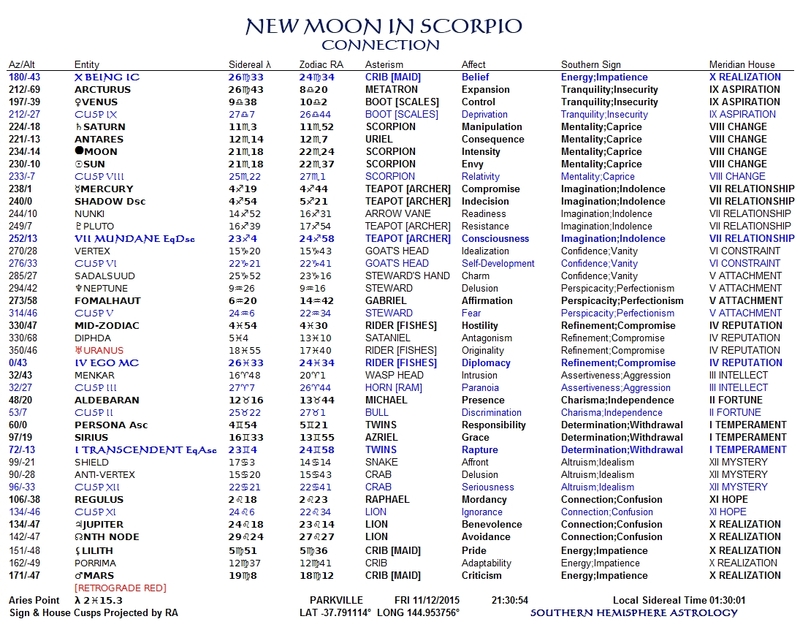 The symbols used in the Moon Chart show us immediately which way the Moon is heading in our view of things. A mandarin’s job is to give form to the ruler’s vision. His aura is charismatic, his skill intrigue, his accomplishment cohesion. A large group of them has assembled in Vienna, in the hope of negotiating a peace settlement in Syria. The precise opposition of this Moon will be above them, hammering the importance of independence and self-criticism, despite the self-justifiers thronging cabinets back home. The impact of tomorrow’s Full Moon is to highlight the swing of opinion we are seeing in relation to radical Islam. Cooperation is being challenged as a value by those who see its tendency to relativism and its accommodation of victim mentality. I cannot remember a more tumultuous upheaval of thought. 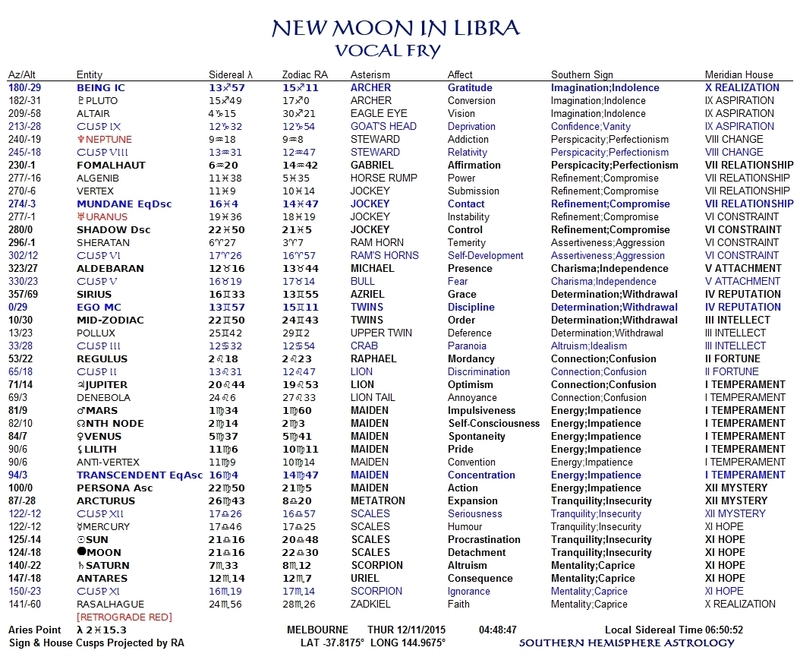 Is it just coincidence that the Moon’s Nodes are announcing a new challenge to us to focus, against a tendency to avoidance? How has it happened that a generation so committed to social engineering, and so engaged now with the eastern philosophy of mind, is so powerless to determine policy on climate change, involvement in the middle-east, and assimilation of ethnic and religious minorities, that they are reduced to shrill opposition? A slightly different question: how can a generation so demonstrably unsuccessful in enhancing its culture with a nutritious and marketable interpenetration of rights and obligations continue to believe that their opinions on world problems are of any value? Where are the charismatic leaders? What are the pop idols saying? What is the image of celebrity? What are the words from the pulpit to confirm the soul of challenge to the resentful assertiveness of alien morality? Is it simply that the parents in lotus-position are unlearning intolerance of the riot of the children? But if nothing is good, and nothing bad, how to understand the intimate coexistence of sanctimony and the idolatrous stature of difference? At the very least, the relationship of order to freedom and peace seems to be an article of faith. Order does not bring peace, nor peace order. The analyst is enigmatic. Is the focus on solutions merely clinging to a denial of death? This is a very insecure Moon. Just get on with it, was my mother’s philosophy. 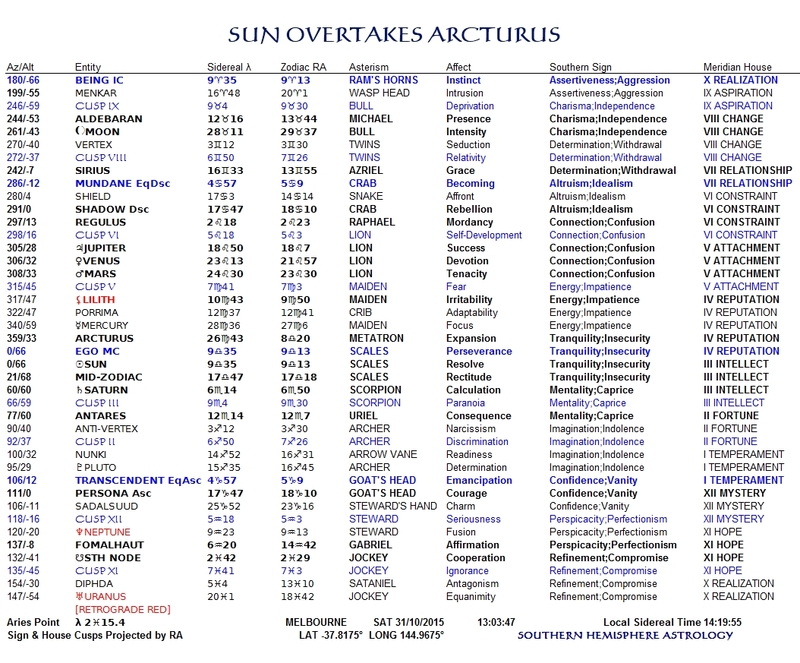 Tomorrow the Sun overtakes Arcturus, the star which culminates at nightfall in Early Spring. The division between Spring and Summer is CRAZED. Regardless of the weather, a profound change is manifesting itself in creaturely behaviour: it is the evolution, out of the turbulence of Spring, of ATTITUDE, nothing less than a consciousness, like a shipwrecked immigrant’s clinging to a slippery rock in thunderous surf, that possibility has limits, and they are OUR limits as integrated selves. How joyfully consequential is our participation as organisms in the tumultuous SPECIES renewal of Virgo and the existential angst of Libra! But now consequence begins to overwhelm. Now is the hour of our fruiting, our parenthood. Summer is DESTINY, not consequence: the duty is upon us to BE consequence, mindfully though we try. 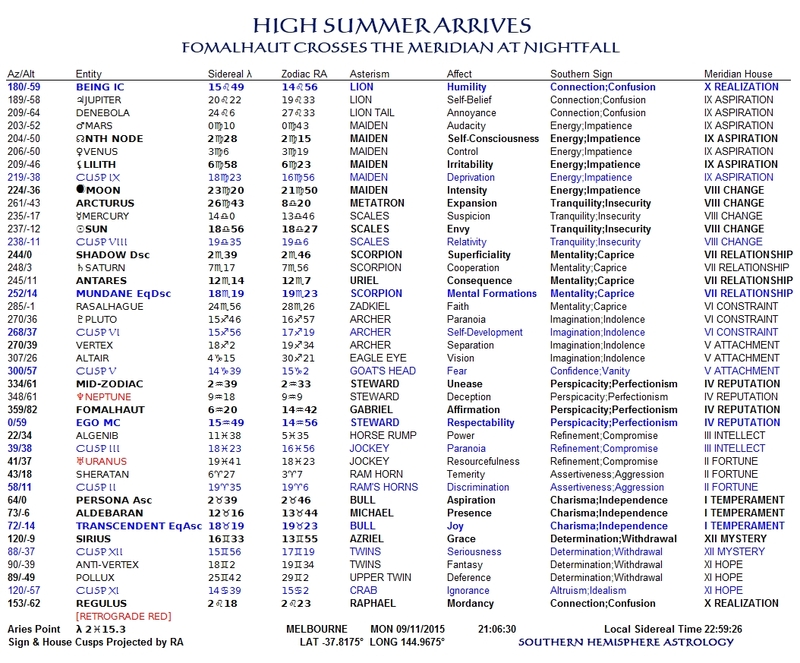 High Summer draws the line, not when the Sun enters Scorpio (and certainly not Capricorn—outdated northern tropical geometry). Summer comes simply, whatever the date, when Spring gets TOO MUCH! And in the same week for Morning People, the grace of the Angel of Death. The small, landlocked, ethnically Arian principality of Aries is in turmoil tonight, as a horde of refugees sweeps across its borders following the announcement of an historic accord between the Eastern and Western Blocs of constellations, which imposes on members cooperation with, and acknowledges responsibility for, the so-called Second Diaspora. A delegation of celebrities from Leo is on its way to urge the government to show compassion, and to apply restraint as activists on the steps of parliament fan the embers of bitter resentment which remain in Aries from the treaty which displaced it so many years ago. Sources have confirmed that the bounty of this year’s harvest could well remain ungathered as the rural population move en masse to the capital, in open disregard of the national interest, to assert what amount to isolationist agrarian values. Their spiritual leader is a pugnacious priest who calls himself ‘Father Moon’, a renowned bullfighter before the ‘sport’ was banned as one of the conditions Aries was forced to accept for continuing membership of the Western Bloc. With violent confrontation between farmers and refugees seeming inevitable, Government spokespeople were this evening remaining tight-lipped.